Masterful 17th C. Oil of the Temptation of Saint Anthony. 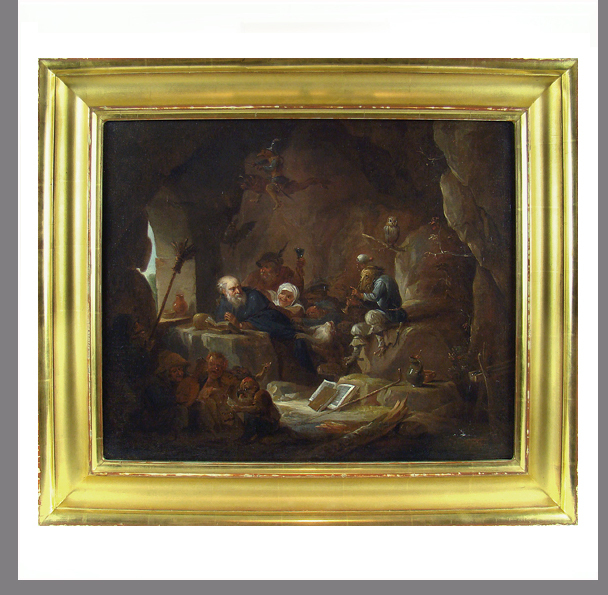 Artist initials were said to belong to David Teniers, the Younger, c. 1680, but I have yet to locate them in the complex scene; the quality and imagery are indistinguishable from the Flemish painter's. I understand the painting was relined, though we haven't unbolted it from frame to confirm. Teniers painted multiple versions of this subject, the last two photos show comparables from the Museo del Prado and Museum of Antwerp. Heavy, water gilt frame has ridge loss, otherwise painting and frame are in excellent condition.